Seventy-five years ago today, six German saboteurs were electrocuted in a Washington, D.C. jail … a failed World War II operation that bequeathed its target nation a controversial legal landmark. On June 13 of 1942 — just eight weeks before they faced the electric chair — Herbert Hans Haupt, Heinrich Heinck, Edward Kerling, Herman Neubauer, Richard Quirin and Werner Thiel, all of them German nationals who had returned to the Fatherland after previous emigration to the U.S., were dropped by U-Boats along with two other men, Ernest Peter Burger and George John Dasch, in two quartets on the eastern fringe of Long Island and the Florida coast. “Operation Pastorius” to sabotage war industries on the U.S. mainland would never even have time to get its land legs; spied in Long Island by a Coast Guard watchman whom they clumsily attempted to bribe, the agents scattered themselves to New York and Chicago. Burger and Dasch — who for this reason were not in the end electrocuted* — had their reservations about the Third Reich to begin with and guessed after the Coast Guard encounter where this fiasco was heading. They rang up the gobsmacked FBI to shop themselves and their comrades, enabling the feds to pick up the other six men in short order. The eventual fate of the Nazi saboteurs is no surprise, but the means to obtain it was controversial then and remains so to this day. ART. 81. RELIEVING, CORRESPONDENCE WITH, OR AIDING THE ENEMY. — Whosoever relieves or attempts to relieve the enemy with arms, ammunition, supplies, money, or other thing, or knowingly harbors or protects or holds correspondence with or gives intelligence to the enemy, either directly or indirectly, shall suffer death or such other punishment as a court-martial or military commission may direct. ART. 82. SPIES. — Any person who in time of war shall be found lurking or acting as a spy in or about any of the fortifications, posts, quarters, or encampments of any of the armies of the United States, or elsewhere, shall be tried by a general court-martial or by a military commission, and shall, on conviction thereof, suffer death. Already recessed for the summer, the Supreme Court hastily reconvened to cut this Gordian knot: the only forum of judicial review the case would ever receive. Its decision, Ex parte Quirin — titled after one of the defendants — spurned Royall’s Milligan claim and upheld Roosevelt’s statutory authority to determine this case for a military tribunal by a unanimous vote. The court’s common front concealed a variety of stances on the reach of executive authority. While the whole court agreed that “Congress has explicitly provided … that military tribunals shall have jurisdiction to try offenses against the law of war in appropriate cases,” a concurring memorandum by Justice Robert H. Jackson — later famous for his role prosecuting the Nuremberg trials — proposed to carry the argument well beyond this point. Jackson claimed in a concurrence that he would eventually withdraw that “the Court’s decision of the question whether it complied with the Articles of War is uncalled for … it is well within the war powers of the President to create a non-statutory military tribunal of the sort here in question.” This was by no means the consensus of his colleagues. The later publication of a “Soliloquy” memorandum by one such colleague, Felix Frankfurter, throws a less than dispassionate light on deliberations. Writing to smooth over internal disputes between the blackrobes, Justice Frankfurter shows himself personally hostile to the Germans — “You’ve done enough mischief already without leaving the seeds of a bitter conflict involving the President, the courts and Congress after your bodies will be rotting in lime,” he chides them in his own voice. “That disposes of you scoundrels.” In the end, the court took his advice to sidestep the potentially deep jurisdictional question. But that question has not been left rotting in footnotes (they never are). Quirin in general and Jackson’s expansive claims of executive power in particular have been relied upon by 21st century Presidents to justify muscular and controversial innovations like the Guantanamo Bay prison and the drone war. Pierce O’Donnell, author of In Time of War: Hitler’s Terrorist Attack on America, discussed his book on C-SPAN here. Jurisprudence is not the only artifact of the Nazi saboteurs’ failed infiltration. 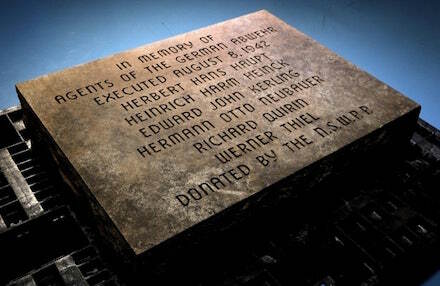 Bizarrely, a tributary slab “in memory of agents of the German Abwehr” was discovered in 2006 illicitly placed on National Park Service land in southeast Washington DC, the same vicinity where the saboteurs had been secretly buried after their electrocution. There it had seemingly reposed some twenty-odd years, unknown but to its devotees … who if the stone’s carvings are to be credited must consist of the heirs of the (defunct since 1983) National Socialist White People’s Party, also known as the American Nazi Party. * They would be condemned to death along with the rest, but Roosevelt commuted their sentences: a fine boon but far short of the outright pardons they had been promised for their cooperation. In 1948, President Truman had Burger and Dasch deported to Germany, where many saw them as traitors. ** After unsuccessfully attempting to trade Andre for Benedict Arnold, whose defection Andre had facilitated, and whom the American revolutionaries would have much preferred to Andre for a hanging. † Enacted by Congress in 1920, these Articles of War are no longer operative in the U.S.: they were replaced by the Uniform Code of Military Justice in 1951. ‡ Haupt and Burger were also U.S. citizens, further complicating the commission’s suspension of their constitutional habeas corpus rights.